Effective group work requires Full Participation. This illustrated 25-page guide will help you master the art of engaging participants in any situation and includes tools and perspectives that will help your group members understand what it means to participate fully. Also includes a full training license so that you can teach this material to others. Why full participation? Explores the benefits of full participation and ramifications of not having it. 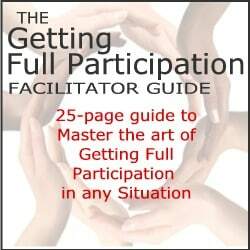 What is full participation? Explores a new model of full participation from a 3-dimensional perspective. Facilitating full participation. Looks at perspectives to take to facilitate full participation using this new model. Facilitator’s full participation inventory. A 10-part self-assessment to help facilitators become better at this skill. Participant’s full participation inventory. A 10-part self-assessment for your participants to help them be conscious of behaviors that make up Full Participation. Full participation strategies. 25 strategies you can employ to get Full Participation. Worksheets. Worksheets to collect your own ideas, resources, and actions to employ what you learn from the guide. Contrarion perspective on full participation. Resources that look at possible negative impacts of full participation. License Rights. Owners of this guide are granted a license to copy and distribute this material in their own trainings, workshops, and groups. Basically, you can do anything you want with this guide expect sell it yourself. Click button to order now. 100% Money-Back Guarantee. If for any reason, you are not satisfied with this product, simply contact us with a request to refund/credit your credit card in the full amount and we will do so immediately. It’s our policy to do this and we honor this in every single case. FacilitatorU.com Membership Option. Become a member of FacilitatorU.com and receive this guide and a host of other items and benefits at an incredibly discounted price. An exceptional value. Click here for details.